A couple of photos there that I haven't seen before Mike, thanks I recognise you, who is the other young man? The other chap is Dave. We were at school together and both loved Dusty; going to any concerts/shows/gigs that she did.We still keep in touch and I am was best man at his wedding and Godfather to one of his children. He was the one that took any pics that I am on. Thanks Jim, sorry to say it didn't work. Needed an app which couldn't be found. Unfortunately I can't remember where I originally found it and didn't note the URL. Found these on the Internet.......................Mirror Pics. Plus these.................. again Mirror Pics. They are a little bit expensive though!! Here are the items I bought on that day. More great "oldies but goodies" Mike - many thanks for these! What a treasure trove you must have?!! I especially love the fur coat earlier images originally seen on the "IOWTBWY" EP - brilliant! I spotted and saved those photos a few days ago Mike and it's always good to find Dusty wearing something that you now own. There is only the front of her shoe showing but I believe it's the pink ones that I got from Sotheby's too. The fur coat shots are just glorious. I have a photo a Dusty wearing that suit in colour, at least I'm presuming they are the same suit, the pattern looks the same, but I can't find it right now. I'll do more of a search tomorrow. Thank you for the fan pics Mike, a couple I had not seen before. I just love that jacket. Thanks for posting............it does look like the same top.Dusty looks happy & geat as usual. Dusty also wore that bangle when she sang with the Petshop Boys at the Brits.I do have a pic of that but not to hand at present. Hope you do not mind but I thought I would share some Sringfield photos. These were obtained some time ago but are genuine signatures.I have not seen the first one before Dusty looks so young and happy!! Wonderful photos, Chris, thanks for posting! There's definitely Something in (her) eyes! Thanks for sharing Mike. Awesome collection. Saw this on Ebay today. It is from a Mag and for sale at £30. Never seen this one before. Anyone know where it was taken?? Thank you Mike, very new to me. I don't know anything about it Mike and haven't seen it before, but it sort of looks like maybe a photographic studio. There are a couple of other photos that remind me of it, one is this one with Eden Kane. Certainly looks like the same outfit Carole. There have been quite a few new old photos appeared on FB in the past week, thanks to Dave Griffiths for the first batch all from the same shoot. Nice to see these on here as well as fb Carole. Thanks Carole. I really like the first one. For someone with such a great sense of humor, Dusty didn't make a lot of funny faces (AFAIK). Yes Mike, it's certainly a bit special :D Another from Dave's collection, Dusty with the first solo NME award. Loving these "off the cuff" photos. Thanks Dave for posting them on Fb and to Carole for posting them on here. Its been amazing seeing all these 'new' photos and cuttings on fb and also on this thread, thank you David. Lovely to see these pics, especially the ones in that favourite suit of ours. 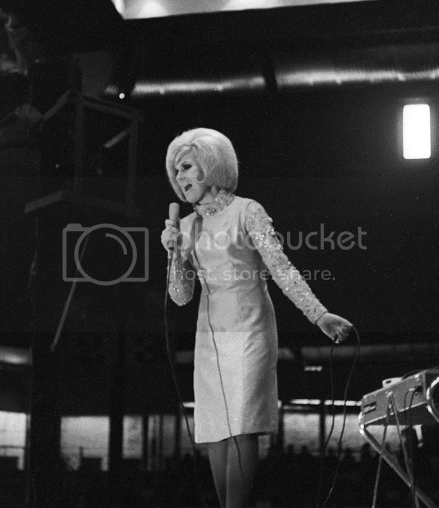 Lovely to see these pics of Dusty.....................so naturaland she looked so happy then. Brilliant treasure house of pics. Photo credit Bob King 1964. I found this while surfing around. It was new to me. This has done the rounds on FB today but for those who can't see it there, here it is. Dusty and Tina Turner on Ready, Steady, Goes Live! Cas19 wrote: Photo credit Bob King 1964. I found this while surfing around. It was new to me. show has been posted before. Thank you Cas for posting this picture. Yes it was taken in Sydney Douggie, I am pleased it holds happy memories for you. Its nice to see these without the watermarks Maggie, thank you. Clive wrote: thanks Carole and Cas. Don't remember ever reading of Dusty performing with Harry Rabinowitz Orchestra, presumably for TV? We need a 'like ' button! I agree, it would be very useful! Not sure it's possible though. Cas19 wrote: We need a 'like ' button! I agree! I actually tried to implement one a few years back, but I don't know enough programming to pull it off. So I'll leave the "Like" button for FB. daydreamer wrote: This has done the rounds on FB today but for those who can't see it there, here it is. Dusty and Tina Turner on Ready, Steady, Goes Live! Great photo Carole, thanks for posting! I didn’t know they shared the stage, it must have been a great experience for both Dusty and Tina. Not very important but, am I right that Tina is only wearing one shoe? Maybe! The shoe on her left foot covers her toes. But her right foot has the tootsies out in the open. Perhaps a mismatched pair?? Didn’t already think of an mismatched pair, it definitely could be (at least it sounds more probable than going on stage while wearing only one shoe…). All in all, they don’t seem to care about it! An interesting photo that turned up on a Facebook page today. Taken on Dusty's tour of Australia in April, 1964. "Legendary Melbourne Disc Jockey - Stan Rofe celebrates a Birthday with Dusty Springfield at 3KZ"
This was new to me when I saw it on fb. Always makes my day to see new pics. Great photograph I see Vic Billings at the back on the right. He was the tallest there. the 3KZ interview were setting up their gear and having a sound check. I met up with Dusty after this interview and we went for a look around Melbourne and had a few laughs. She was a bit wet when she got back the hotel, it hadn't rained she got wet through me pushing her off the fountain wall she was walking around that was in the Southern Cross Hotel court yard. I made out that I was going to push her in, and she said I wouldn't dare. She dared me! so I did. She was wrong!! She liked to do fun things to others, but didn't mind if it was to her. She just loved having a laugh. It was these kind of things that made us good friends. We always found things to laugh at. Sadly they pulled down the hotel several years ago. I think she had a really great birthday that year, Fun times!! I have written some of these things down from this tour somewhere. Thanks for sharing it all. Such happy times for all of you. The perfect link to the photo! Great story Douggie,it is good to hear the good times Dusty had off stage. Love her. Lovely to hear your memories Douggie, if only you'd taken a photo Do you mind if I share your story on the FB pages where I posted this photo? Vic looks very happy to see his 'charge' enjoying herself. What a lovely story, Douggie! Thanks for sharing! Such a great story Douggie! It definitely brings a smile on my face when reading about these kind of fun times. And of course thank you for sharing this picture Carole. A birthday cake, recordplayer, people with partyhats and a very happy looking Dusty… what else do we need for a good party? daydreamer wrote: Lovely to hear your memories Douggie, if only you'd taken a photo Do you mind if I share your story on the FB pages where I posted this photo? Vic looks very happy to see his 'charge' enjoying herself. happiest and most enjoyable times. After this time she went of to the States and sadly we all know what happened then. All the guys just loved Dusty and some of the things she did were magical. us knowing we were there for her as we always had been, and still are. Last edited by Douggie on Sat Aug 05, 2017 4:00 am, edited 5 times in total. she walked around the top edge just before I pushed her in the water. The main entrance was the other side of the building. Fun story Douggie, its always a treat when you share your memories. Thank you. It is Kiki. The photo was taken at San Remo in 65. Thanks for sharing the story, Douggie. I love hearing of small incidents of her everyday life that give us a picture of who she 'really' was. Glad also you have such happy memories of your friend. Just adding Richard's 'new' photo to this thread. That’s a great pic Carole. Wonderful find Carina. Dusty & Carole look stunning there. Fabulous to have such a clear pic of them together. A very good name for that group. Still find it so sad that Dusty got herself in such a mess in those sad lost years of her life. How i wish for that time machine we used to talk about. Its nice to see new pics, thank you Carina. I came across this photograph of The Springfields, which I do not recall seeing before. It appeared on a news website called Devon Live. It was part of a feature on Lionel Digby, who, amongst other things, runs a theatrical costumiers business in Torquay. Digby is standing on Dusty's right. The other man is Mac Johns who was bass guitarist of The Barracudas. The photo was taken in Torquay Town Hall and is described as 'early 1960s'. As it includes Mike Hurst, the picture must have been taken in the last year of the group's existence. Its one I have seen before but this version is so much clearer. Former member of Britain's top vocal group the Springfields, Dusty Springfield has more than justified her decision to go it alone. Her first solo disc I Only Want to Be With You released in 1963 went straight into the charts and established her as a popular, talented and 100 percent professional artiste. Subsequent singles Stay Awhile, I Just Don't Know What to Do With Myself and more recently Losing You zoomed into the British charts. American chart success came with Stay Awhile and Wishin' & Hopin' which won her a Cash Box Silver International Trophy and currently All Cried Out. A truly international star, Dusty has recorded in French, German, Italian, Spanish and Swedish. Albums: A Girl Called Dusty EPs: I Only Want to Be With You and Dusty. Thank you , nice to see this. Four more pix - with blurbs - from Cash Box - click to enlarge (they're all contained in a single image). Thank you Richard! Both pics on the right are new to me too, as is the blurb with the High Voltage photo. Wow Richard these are so amazing to see, thank you very much. I hope that you don't mind that I share them with LTD fb page. Lovely to see these "new" pictures. Thanks for taking the time to put them on here Richard. I'm loving these new finds Richard, thank you so much. I visited San Remo about 10 years ago and could recognise where they both are standing, you can see it on this aeriel shot, recognised by the pillar behind them. It's a pleasure to post these pix and please do spread 'em around as much as possible! I'm puzzled by the sign in the picture: "Permanente" just seems to mean what "permanent" does in English, being either an adjective meaning "everlasting" or a noun referring to a processed hair style - given Dusty's coif-fixation the last interpretation seems apropos but hardly explains the sign! I fear I may not be able to keep the pix a-comin': after a banner year for Dusty blurbs and pix in the US music trades in 1964 there seems to have been a downturn in '65 with the San Remo pic the only "candid" to appear in Cash Box (as opposed to none in Record World) and surprisingly the lack of Dusty-ness continues through 1966 as YDHTSYLM seems to have become a smash in the US with virtually no promo in the trades. Of course the most esteemed US music trade has always been Billboard and when I have a chance I'll peruse that magazine's back issues through the mid-60s and I'll also check all three trades for latterday Dusty pix. The above is a backstage shot from the March 1968 edition of the Grand Gala du Disque held in Amsterdam. According to Paul Howes "a row with the organizers over the time made available for rehearsals" would cause Dusty to opt out: she'd previously withdrawn from the Grand Gala's 1964 edition shortly before her scheduled performance. Altho Howes' résumé of Dusty's televised performances lists a March 1969 Grand Gala du Disque appearance Howes has admitted to misunderstanding a reference to Dusty performing at the Gala-Abend der Schallplatte in Berlin. (The relevant 2010 LTD discussion may be viewed here: http://www.dustyspringfield.org.uk/ltd_ ... to_ten.pdf) Unfortunately there seem to be no visual clips or pix of Dusty's Gala-Abend performance. The second is a backstage shot from the Astoria in Finsbury Park which on September 27 1966 was host venue for the inaugural gig of a package tour which besides Dusty and Alan Price featured Dave Berry and the Fortunes. "Don't mind if I keep this headscarf on do you, Alan? Just had my hair fixed for a show-date this evening." A candid of Dusty from the May 1964 issue of Rave magazine taken at the Maida Vale flat of Pick of the Pops presenter Alan Freeman whose "Heart-to-Heart" interviews were a regular Rave feature. Freeman supplied Dusty with coffee and buns - "plenty of the [the latter] because Dusty...dislikes getting up too early [&] prefers a hearty snack in mid-afternoon" - while the Shirelles - Dusty's choice - and then Peggy Lee played in the background. I love all the shots from this thie Richard, with Alan. As I've mentioned I'm not finding a lot of Dusty pix in the US trades post-1964 but I did come across a couple I think will be on interest especially the first, although the Clinger Sisters are a curio perhaps worth learning more about: a 60s TV variety show staple as a distaff version of the Osmonds (with whom they share a Mormon heritage) the Clingers' musical direction veered sharply at the decade's close when they became the first female band to be produced by KIm Fowley, six years before the Runaways' debut album. From the early 70s the four sisters pursued separate careers but did reunite for the Christian-themed 1990 release The Fountain the group's sole album. I've saved the two articles as one image: it does enlarge somewhat if clicked - altho I still can't make out Dusty's pendant! Last edited by Sweetbaby on Mon Jan 22, 2018 8:24 pm, edited 1 time in total. Thank you Richard the first one is new to me, good find. I will share with LTD fb page as soon as it will allow me to go on there, its acting up this morning. Thanks again Richard, especially for the one with Dee Dee, lovely photo. It's good to know she had plenty of backstage support. The writer does have a way with words The show she did with the Clingers has survived I believe, maybe one day..... Here's closer photo of Dusty's pendant. Man - Texas must be big to hold that much mascara! Seriously Carole - like that was funny! - thanks for the enlargement: Dusty’s pendant looks pretty much as I’d have suspected but seeing the fringe on it IMHO ID’s it as a Native American talisman. I trust those are magnolias on the hat! Both upper and lower images may be clicked to enlarge. Thank you Richard, the one of Dusty and Rod is a great find, one thats completely new to me. Good searching.